Let me get this out of the way right out of the gate: I love Chrome OS. I wanted to love it back when I reviewed the original Chromebook Pixel some years ago, but it just wasn’t where it needed to be for me. Fastforward a bunch of months, and Google made a ton of useful and thoughtful changes that made Chrome OS a legit desktop contender (for me at least). So, like I said in my recent What We Use post, I made the leap to Chrome OS as my main laptop about 18 months ago (or so) and haven’t looked back. I still have a Windows desktop for all the “heavy lifting,” but for the most part Chrome OS does everything I personally want. One of my favorite things about Chrome OS is just how versatile it is—it requires such limited hardware, it can run on almost anything. Low-powered Chromebooks are everywhere these days, and while once upon a time we probably would’ve told users to stay away from these underwhelming systems, they are legitimate laptops at this point in time. Hell, I use my Chromebook Flip as my main laptop now. It’s mind blowing. 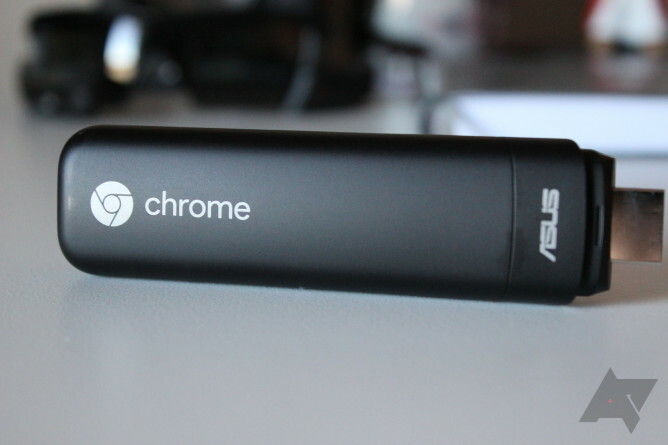 Now, that was a little long-winded, but I feel like a little bit of backstory was necessary before we get into my time with the new ASUS Chromebit. This is a new sort of device for the Chrome OS family—it’s not quite a desktop and not quite a laptop, but something sort of in between? 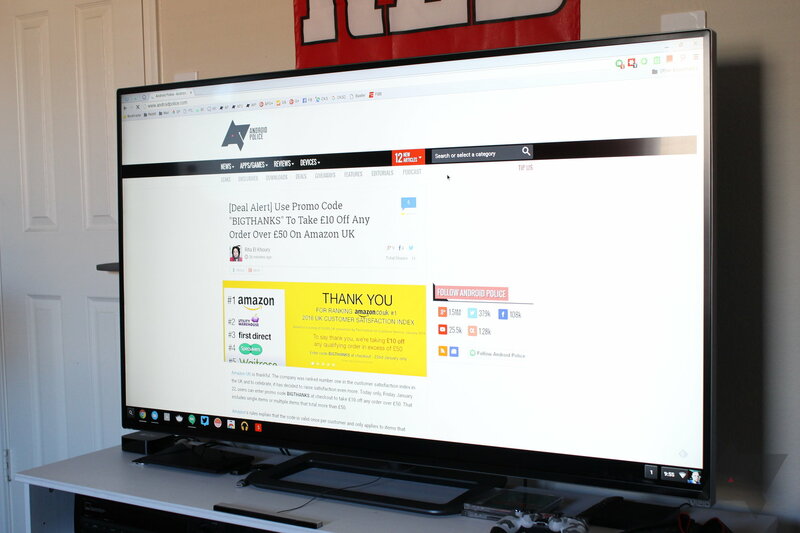 It’s super portable—about the size of a candy bar—and can plug into any HDTV or monitor. It uses Bluetooth to connect to a keyboard and mouse, so it’s incredibly versatile. Even as far as Chrome hardware goes, it’s slightly under-powered in the RAM department, but otherwise it’s pretty damn solid for just $85. Note: I use all my Chrome OS devices on the dev channel, and the Chromebit wouldn’t sync my apps, extensions, and bookmarks until it was also on the dev channel. I don’t feel like this affected the outcome of the review in any way, but wanted to make it known. Compact Need to take your desktop wherever you go? 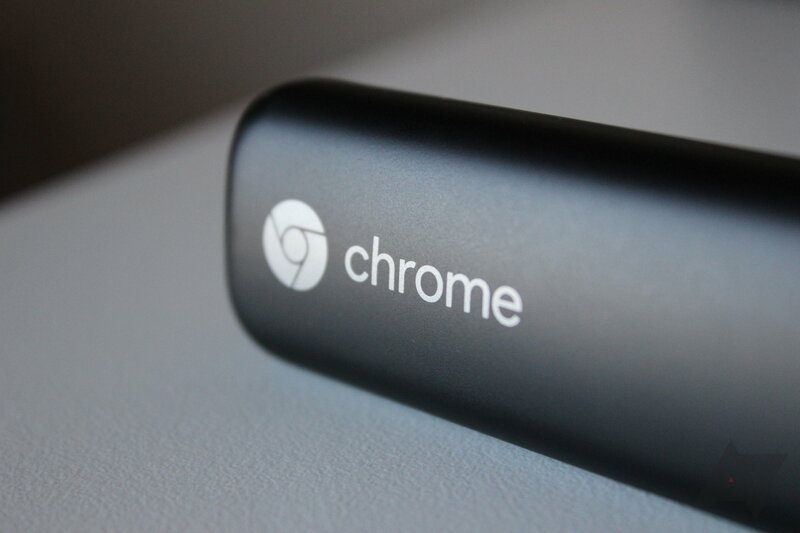 Chromebit is your huckleberry—it’s super small and portable, and will connect to any screen with an HDMI port. That’s pretty neat. Surprisingly good performance I’ve come to expect good performance on limited hardware with Chrome OS, and the Chromebit is no different. I’d like for it to have more RAM, but I’ve been pretty impressed with what it’s been capable of on just 2GB. Good price It’s a full Chrome OS experience for just $85. Assuming you’ve already got an extra Bluetooth keyboard and mouse lying around the house, you’re in the game for under a Benji. Limited RAM If I had to choose one thing to dislike about the Chromebit, this would be it. I’d love for it to have at least 4GB. Not as good of a value for some users If you don’t already have a Bluetooth keyboard and mouse, the value drops since those are both required to use the Chromebit. You can easily spend upwards of $100 on a decent keyboard and mouse, which combined with the price of the Chromebit puts you close to the price of a Chromebook or Chromebox. No Chrome OS keyboard The Chrome OS keyboard is different than a “traditional” Windows or Mac keyboard—it’s designed specifically for Chrome OS. As a heavy Chrome OS user, I’ve gotten used to the OS’s keyboard and shortcuts, so trying to use a keyboard that’s designed for Windows on Chrome OS has been a bit challenging. Update: As someone in the comments pointed out, here's a wireless Keyboard/Mouse combo by ASUS designed just for Chrome OS. Won't break the bank, either. Perfect! It has a cap I lost the cap almost immediately. Seriously, why does it have a cap? So stupid. 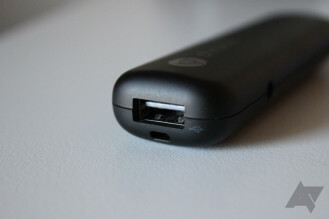 While there isn’t a whole lot to the Chromebit when it comes to size, it is an entire computer stuffed into a little bitty stick. So there isn’t a whole lot to talk about when it comes to form factor and whatnot, but the unit itself definitely warrants some conversation. First off, there’s the processor. We’ll get into more details about the performance later on, but it’s worth mentioning that the Chromebit has the same Rockchip processor that’s found in the Chromebook Flip, which is an absolutely beastly little chip for the money. I’m a daily Flip user, and there hasn’t been a time when I felt like that chip was hindering my everyday use—as long as you keep in mind that it is a mobile chip, anyway. 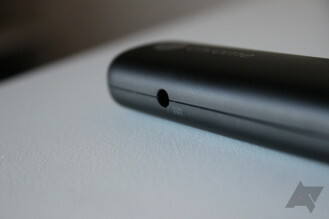 But in terms of performance and snappiness, this little chip is pretty incredible for the price. Otherwise, there’s only one real limitation: 2GB of RAM. There is only one version of the Chromebit, which comes in at $85, but I would really like to see a version for $99 or even up to $110 with 4GB of RAM. That said, while I definitely tried to push the Chromebit to its limits and bog the system down, I’ve been fairly impressed with how it feels with just 2GB. You can definitely tell when it gets close to full, though. Past that, it’s a very simple, clean system. It of course has the HDMI output and small port for the included AC adapter, but there’s also a single USB 2.0 port found on the bottom. This can presumably be used for things like storage expansion, but should also be compatible with most USB hubs should you need to connect several different things to it at once. Might come in handy if you don’t have a Bluetooth keyboard and/or mouse and want to give it a shot with a wired setup. I don’t have a hub handy, so I couldn’t actually test that. Sorry. So, it’s Chrome OS. Like I stated in the disclaimer at the beginning of this review, I had some issues getting the Chromebit to sync my apps, extensions, bookmarks, and other data, so I switched it to the dev channel since that’s what my other Chrome OS devices are running (I like to live on the edge). After that switch, everything synced perfectly. Again, I just wanted to make it known that my time with the Chromebit was on the “bleeding edge,” but most things in Chrome OS are pretty much the same across the board so it really shouldn’t have hindered my testing in any way. In my experience, even the dev channel is stable enough for everyday use anyway. 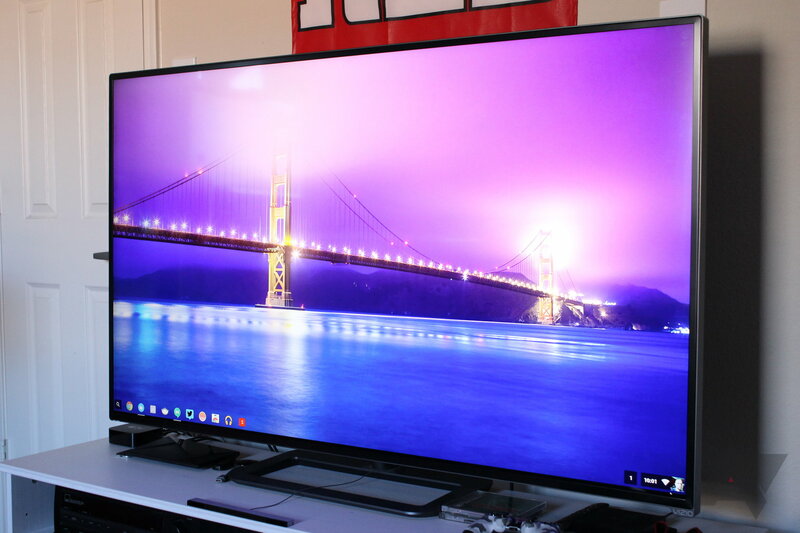 So yeah, what is there really to say about Chrome OS? If you’ve used it, you know what to expect—there’s no ASUS customizations or any other sort of modifications going on here. It’s pure Chrome OS. If you haven’t used it, well, then let me talk about that a little bit. First off, Chrome OS has really grown over the past couple of years. Like, a lot. I still remember the good old days of “why would anyone want a computer that just runs Chrome? !” and then the subsequent arguments that happened thereafter. Today, there’s no reason to think that running “just Chrome” isn’t powerful and useful. The introduction of the Chrome Web Store went a long way in helping Chrome itself become a more powerful browser, and it also basically put Chrome OS in the “full operating system” category. In fact, I use more Chrome apps on my Windows PC than I do traditional Windows applications. Most of what I do every day is in Chrome, and I like it that way. 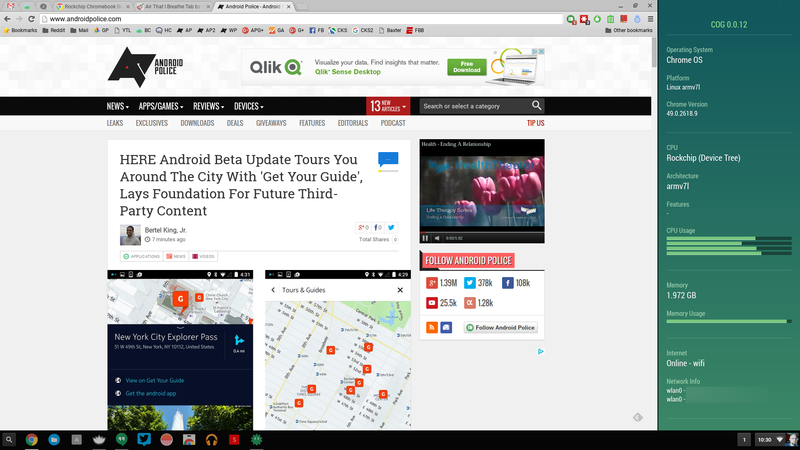 If you live in the same boat, Chrome OS is for you. I understand that it’s not for everyone, and that’s OK. 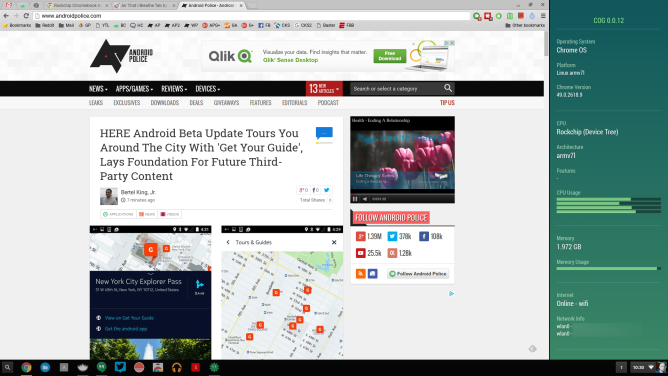 If you can live your entire digital life in Chrome, though, it’s hard to beat Chrome OS. Is it advantageous over a Windows PC in any way? Honestly, not really; there are a few things to consider, though. The price is lower than a “traditional” PC, so there’s that. The performance that you get for that price is also a much better deal than with a PC. I mean, would you rather have a $200 Chromebook or a $200 Windows PC? I realize there will be people out there trying to justify why the Windows PC is better (even at that price point), and that’s fine—but for my money, I’d go with Chrome OS every time. For me, it’s just about doing things a different way, in a different environment. The fact that I can almost replicate my experience between Chrome OS devices and Windows computers is just a bonus. This is where the Chromebit really shows its value. Like I said earlier, it has the same chipset as the Chromebook Flip, which has consistently impressed me from the first time I opened it up and logged in. For what it is, it really takes a lot to bog this chip down. The Chromebit's performance is easily on par with the Flip, too. I was able to keep both of my Gmail accounts open, along with the Android Police to-do list, our chat service, and Pandora (all in pinned tabs) along with whatever I was reading/researching/whatevering at the time. I'd say at any given point, there were probably at least 6-8 tabs open. Using Cog to keep an eye on the system, the Rockchip processor never got bogged down with regular usage. It's astonishingly efficient. Where the Chromebit does fall short, however, is the RAM. I know I've mentioned this a couple of times already, but I still think it's worth a bit more discussion. Now, before I jump on the hate train, I will say that I was surprised with how well the unit performed with just 2GB of RAM—something I never expected. My original Samsung Chromebook had only 2GB of RAM, and I specifically remember having to keep a close eye on how many things I had going on at once, lest it would just get too unresponsive. It hasn't been that bad on the Chromebit, but it's definitely noticeable when too many things are running in RAM at once—the scenario I gave earlier with everything I had running really pushed the limits of what the RAM can handle. Closing out one of the Gmail tabs helped tremendously, so keep in mind that you won't be able to do a lot of heavy multitasking on the Chromebit. The processor can handle it, but the limited RAM shows its ugly face pretty quickly. That said, I also have a few things in place to make using a low-RAM system a bit easier, like The Great Suspender, which puts tabs to “sleep” after a period of inactivity, as well as…AdBlock. Look, I get that it may be slightly hypocritical of me, but blocking ads on sites that do nothing but load the system down is something that basically has to be done when RAM is at a premium. Sorry. The only other thing worth mentioning here is the wonky performance that I had with the keyboard. I used a Logitech K810 Bluetooth keyboard (which is one of my favorite small keyboards), but it had all sorts of connection issues with the Chromebit. First off, it would routinely take forever to connect, and sometimes once it finally got a connection it just wouldn't work correctly. For example, if I hit the "F" key to test the connection, it would output like 47 Fs. Maybe more. Then when I'd try to backspace, it would act as if the backspace key was stuck, thus deleting far more than what it should've. This only happened twice during my testing, but the fact that it happened more than once means that it wasn't just some one-off fluke incident. Now, this could be due to the fact that I'm using the dev channel, but considering the mouse connected instantly and worked perfectly every time (and I've never had a single issue with the K810 before), I'm kind of inclined to think that's not the case. All that said, your mileage may vary, and using a different keyboard/mouse combination would almost certainly yield different results. Like I said in the beginning, I'm a huge fan of Chrome OS. I've been using it exclusively on my laptops for over a year, and it keeps getting better with every update. I was excited to give the Chromebit a whirl, because in my mind this is a great, inexpensive way for users who may be curious as to what Chrome OS is all about and how it may work in their everyday lives. But it's more than just that—it's perfect for the current Chrome OS user who may not want to work on a laptop all the time and has an extra monitor, keyboard, and mouse lying around. Or the person who loves the idea of having a full computing experience from the couch, using the TV as a monitor (which is exactly what I did for this review, by the way). Of course, there's also the other side of that argument: why not just buy a Chromebook or Chromebox? By the time you pick up a Chromebit, along with a Bluetooth keyboard and mouse, you're easily in the same general price range where a different Chrome OS device is an option (and possibly even a better one). But if you've already got everything you need and just want to get your toes a little wet, the Chromebit is a good way to do that. It's not as easy or simple of a call to make when you don't have a plethora of extra peripherals lying around, however. Ultimately, I like the Chromebit. I wish it had more RAM (even if that meant releasing it at a slightly higher price), but it's fine for a casual-use device connected to the TV. Or a simple plug-and-play stick for the kids to check email, watch YouTube, or do some school research. It's not really made for anything past that, but it can handle a handful of tabs running at the same time, so multitasking isn't out of the question. Whether or not the value is there for you, though, is a totally different story. If you've got the extra hardware, I say go for it. If not, however, I'd pay close attention to the other options out there before pulling the trigger on this one.